In a medium bow, mix together all the sauce ingredients. I put the lentils in the pressure cooker with the sauce and cooked according to mealthy's recipe. 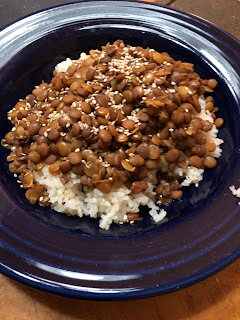 Cover and (Or bring to a gentle simmer until the lentils are cooked and tender, and most of the liquid is absorbed, about 8 to 10 minutes). Serve by spooning over rice, and garnishing with sesame seeds.